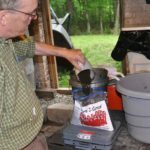 Vermicompost – OurCompost™ is our trademark blend of decomposed kitchen and yard waste digested by our worms – a rich, loamy, heterogeneous mix of what plants grown in best. Containing many essential water-soluble nutrients (see: NewSoil’s bi-annual mandatory State test results), vermicompost is an excellent, nutrient-rich organic fertilizer and soil conditioner. 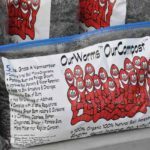 OurCompost™ contains at least 20% or more pure worm castings. The reason for the superiority of OurCompost™ is simple: what goes in comes out! Only the best, most pure and appropriate organics go into the compost mixture that turns into our very own brand of vermicompost. And since our household supplies the kitchen and yard waste that goes into OurCompost™, the exacting standards to which we hold our supply insures an excellent end product. The “green” or nitrogen-rich ingredients of our worms’ diet are solely the vegetarian waste products of our 3-member household, as per City, County, and State requirements for a business run from a residential property. There is no meat included in our composted table scraps and little (less than 5%) dairy and oils. Typical contents of our family’s compost pail are: vegetable and fruit peelings, stale bread, coffee grounds, egg shells, non-meat-containing food that has spoiled in our refrigerator or pantry shelves, etc. We supplement our worms’ diet with close-to-expiration fruits and vegetables on sale at our local markets, as well as cheap grains such as rice and oatmeal. Scraps are ground in an industrial food processor and fed to the worms along with the appropriate amounts of “brown” or carbon-rich ingredients, which consist uniquely of partially composted and sterilized dead leaves from the trees on our property: pin oaks and red oaks. There is generally a 40%-60% to 50%-50% ratio of green vs. brown ingredients. Lately, with the approval of the State, we have begun to experiment with different feedstocks for our worms, including goat manure from a local organic goat farm, and coffee grounds from local cafés. We sell OurCompost™ in packages of 5 and 10 pound increments, though larger amounts can be arranged by special order. Each bag comes with detailed Use and Application Instructions, as required by law. OurCompost™‘s labels were approved by North Carolina’s Department of Agriculture and Consumer Services, which also registers our product on a yearly basis. Our site is inspected and approved on a yearly basis by the NC Department of Environment and Natural Resources, and is in total compliance with Section .1400 of the State’s Statutes (Solid Waste Compost Facilities). Were are also in full compliance with all regulations of the City and County of Durham. We are in the process of being certified by the U.S. Dept. of Agriculture’s (NOP) National Organic Program, a three-year process. We soon hope to receive our STA (Seal of Testing Assurance) from the U.S. Composting Council. Hello. I’m an avid home gardener and I need to augment the soil here in my yard. 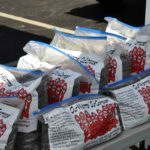 Can you tell me how much a 5 pound bag of worm compost would set me back? Also, I discovered you guys at the Farmers Market — is that where I would purchase compost?